“Hey, mom,” says hans doellgast, as he strides into the master bedroom of his mother’s home in Haw Creek. It’s hot outside, and with a slim coat of dust on his boots and his long blonde hair pulled into a tight knot, you can tell he’s been working hard. The humid afternoon seems far away here in Janet Doellgast’s cool and blissfully airy room, complete with a beamed vaulted ceiling and iron bed dressed with a homey quilt. “Can you come outside and look at the rain chains?” he asks. Janet hops up from her chair and follows Hans outside. He and a crew dangle a half-dozen linked strands from the roof. During a storm, rain will cascade down the chains, providing a more attractive water channel than any run-of-the-mill gutter. Janet folds her arms and considers. She loves them, of course, and the work goes on. It’s evident, as Janet opens the cherry back door and passes by the stairwell with hand-built railings and shallow under-stair shelving, that these amicable mother-son consultations are par for the course. Hans is more than Janet’s son and rain-chain installer. He’s also the owner of Jade Mountain Builders, the company that constructed his mother’s home set amid picturesque farmland. The result is a nearly 2,300-square-foot house that melds Han’s calling card of green and energy-saving building techniques with Janet’s eclectic, arts and crafts-inspired style. “We call it whimsical storybook,” he says. It fits. Picture Little Red Riding Hood’s eco-minded grandmother’s house. 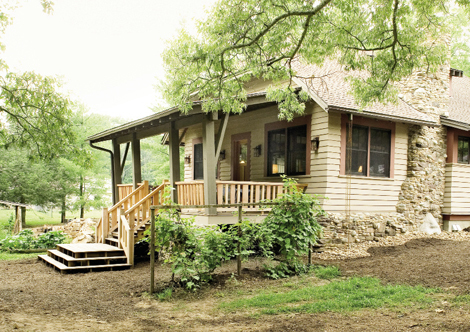 A wide front porch constructed with locally harvested, milled, and processed locust beams is framed by hemlock rafters. Here, Janet’s mix-and-match pairings of rockers, chairs, and iron yard furniture welcome visitors. Lap siding cozies up to banks of windows. A combination of fieldstone and river and quarry rock, reminiscent of a creek bed, set the foundation, chimney, and fireplace to reinforce the cottage feel. An appetizing array of vegetables and herbs—everything from yellow crookneck squash to the wispy Sweet Annie herb—fills an organic garden to the south. To the north, bunches of ripening grapes hang from vines that predate the dwelling. The eco-friendly touches seamlessly integrate into the design. Hans predicts a batch of solar panels on the roof will generate enough electricity for the home. And the fireplace insert can heat the entire space, if need be. The floors and wood trim are made of locally harvested cherry. In the bathrooms, cork flooring is paired with tile made of partially recycled materials. There are a few unexpected elements as well. Hidden among the stonework, laid by Ricki Pierce (aka Ricki the Rock Pirate), are four ceramic “fairy doors” and windows made by Pierce’s wife, Damaris. The tiny decorations beckon entrance into another world. “They were a surprise,” Hans says. They were a happy one, and a fantastical touch to a home which represents a new beginning for this family. “Hans talked for years of building a home for my husband, George, and I when we retired,” says Janet. But that plan was unexpectedly accelerated when, in January 2009, after 37 years of marriage, George died while biking in the Santa Monica Mountains, close to the couple’s home in Thousand Oaks, California. After his sudden death, Janet moved to Asheville, where Hans had made his home after graduating from Warren Wilson College. The two worked to find an architect that could interpret Janet’s aesthetic and philosophical perspectives, which are tied closely to nature and the influence of her parents. Allen and Virginia Lee Menke, fostered her choice in style. “[My mother] sent me lots of books on the arts-and-crafts movement and on arts-and-crafts historians,” Janet says. They served as important references, as architect Michael McDonough designed the home. Construction began in the fall of last year, and in January, Janet moved in, even as workers continued to saw, hammer, and paint. “It was a lot of fun because there was company all day long,” she laughs. Crews erected a temporary wood shop in the attic, where they built the extensive cabinetry found throughout, from the kitchen’s bank of cabinets and U-shaped center island to the cupboards in the laundry room. “There was so much sawdust everywhere, I didn’t bother to clean,” she laughs, considering some dirt is nothing compared with the mess of construction. Much of the furniture and décor was found at antique shops over the years, says Janet, a consummate bargain hunter. Two figurines in the kitchen, one of a woman collecting herbs and another of a fisherman—made in the Les Santons (or little saints) tradition—were purchased during a trip the couple made to Provence, France. She doesn’t like showy things. Her bed is from Habitat for Humanity’s Home Store in Asheville. Her breakfast table had a former life as a garage work counter. “It was covered with layers and layers of paint,” she says, until George refinished it. Other items are special pieces passed down from family members. A large, yellow tufted couch comes from Janet’s grandparents’ home, as do many of the Persian rugs. Her mother’s high chair sits at the breakfast table and regularly holds one of Hans’ two daughters. “Sierra and I have tea parties when she comes home from school,” she says. And while Janet puts George’s “Onward and Upward” motto into practice daily, she also has already made her home a beacon of hospitality. “It’s a base camp for friends and family,” she says, and a natural role for the home that mother and son built.